Veteran actress and evangelist, Eucharia Anunobi lost her only child to sickle cell anaemia last week. 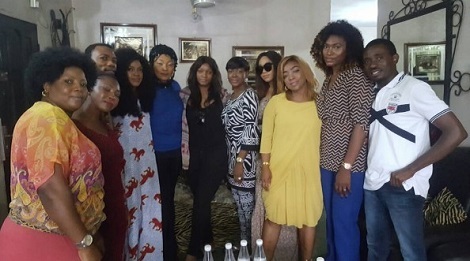 And her colleagues, Omoni Oboli,Ufuoma MCdermot, Susan Peters,Omotola Jolade,Rukky Sanda, Bimbo Akintola, and others paid a condolence visit to her. Susan peters shared the photo.